Make an appointment today. Eye care for all ages. Call us at (918) 396-4440 today. We offer a full range of services to meet all of your family's eye care needs. 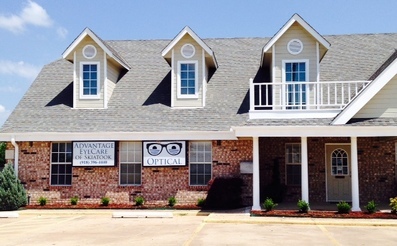 Welcome to Advantage EyeCare of Skiatook in SKIATOOK. Dr. Brett Enyart and the Advantage EyeCare of Skiatook team strive to provide the best in optometry services. We invite you to browse our website to learn more about our optometry services and join our patient family by scheduling an eye exam appointment at our SKIATOOK office. Advantage EyeCare of Skiatook is a full service eye and vision care provider, accepting both eye emergencies as well as scheduled appointments. Patients throughout the SKIATOOK area come to Advantage EyeCare of Skiatook because they know they will receive the personal attention and professional care that is our foundation. Dr. Enyart and our team are dedicated to keeping our patients comfortable and well-informed at all times. At Advantage EyeCare of Skiatook, we will explain every exam and procedure and answer all of our patients' questions. Additionally, at Advantage EyeCare of Skiatook, we offer vision financing options and will work with vision insurance providers to ensure good eye health and vision care for all of our patients. Our one-on-one approach to optometry makes Dr. Enyart and the Advantage EyeCare of Skiatook staff the eye and vision care providers of choice in the SKIATOOK area. Our SKIATOOK optometrist offers the following services: complete eye exams, contact lenses, glasses, glaucoma testing, and pre- and post-operative care. For a complete list of services, visit our services page or call our SKIATOOK office at (918) 396-4440. At Advantage EyeCare of Skiatook, we are dedicated to providing high-quality optometry services in a comfortable environment.Call us at (918) 396-4440 or schedule an appointment today online. Dr. Brett Enyart received his Bachelor of Science from Northeastern State University and then earned his Doctor of Optometry degree in 2000. During his clinical training, Dr. Enyart completed an internship at Eye Associates of New Mexico in Albuquerque and Santa Fe. Dr. Brent Plaxico received his Bachelors of Science from the University of Oklahoma in 2002 and then earned his Doctor of Optometry degree from Nova Southeastern College of Optometry in 2006. After graduation, he practiced in the Columbia, SC area for 8 years, owning and managing his own clinics in Camden and Blythewood, SC for 6 years. In 2015, Dr. Plaxico sold his clinics and moved back to Oklahoma. "The staff is very knowledgeable and kind! Dr. Enyart is amazing! Very thorough, patient (I had all 4 kids ages 3-10 at once! ), friendly, and you can tell he enjoys his job!!" "The employees are great, always so friendly and helpful. Doctors too, they really care about making sure they do everything possible to make their patients feel comfortable and welcome. They never make you feel rushed or like a burden, they answered every question I had. I am so happy to have such a great Eye Doctor in our small hometown of Skiatook. Definitely will recommend them to everyone I know. Thanks Advantage Eye Care!"